Fripp Design is a Sheffield based Product, Concept and Industrial design company. Fripp specialise in taking client ideas from conceptualisation through to prototyping. Our designers have Masters Degrees in Industrial Design and Rapid Prototyping; we are experts in design. Fripp own and operate a ZCorp 3D Colour Printers; the quickest and most cost effective way of visualising products before committing to manufacture. 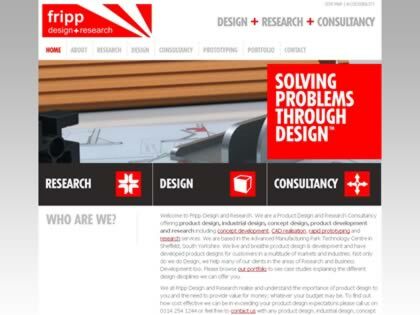 Web Site Snapshot: If available, above is a snapshot of the Fripp Design Limited web site at http://www.frippdesign.co.uk as it appeared when this site was added to the directory or last verified. Please Note that Boat Design Net has no involvement with the above web site; all content and images depicted in the above thumbnail are the property and copyright of Fripp Design Limited unless otherwise noted on that site. Description: Fripp Design is a Sheffield based Product, Concept and Industrial design company. Fripp specialise in taking client ideas from conceptualisation through to prototyping. Our designers have Masters Degrees in Industrial Design and Rapid Prototyping; we are experts in design. Fripp own and operate a ZCorp 3D Colour Printers; the quickest and most cost effective way of visualising products before committing to manufacture.